While topics like sweater weather and pumpkin spice might be dominating much of the conversation, over at the American Lighting Association we’re excited about the energy savings that come along with cooler weather! This week, we celebrated the fifth annual National Ceiling Fan Day (NCFD), which got us thinking about what excellent energy-saving resources fans can be. According to NCFD founder Fanimation, if every American turned off their air conditioner and used fans for their cooling needs on NCFD, the U.S. would save enough energy to power the entire city of New York for months. Figures like this have us asking ourselves, are we getting the most out of our ceiling fans? There two key efficiency measurements to consider when choosing a ceiling fan: Cubic Feet per Minute (CFM) and Air Flow Efficiency (AFE). CFM is the measurement of how much air is being moved and AFE is the airflow on high, divided by the watts used (the higher the number, the more efficient the fan). You’ll find both of these numbers on top of the fan box, or you can always learn more from a trained professional at a local Hortons showroom. To ensure you’re getting the best airflow from your ceiling fan, you must hang the fan at the correct height from the floor. If you hang a fan too high, you will decrease the airflow and lose some of the cooling effect. The blades of the fan should generally be between 8 to 11 feet off the ground, depending on the height of the ceiling, size of the room and other design aesthetics. 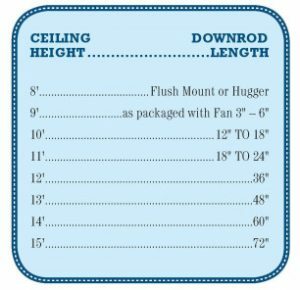 Take a look at this helpful chart comparing ceiling height and suggested fan down-rod length from the Hortons Lighting Planning Guide. As with all products in the lighting industry, LEDs and advancements in technology are changing the way ceiling fans are designed. Today’s ceiling fans come in all shapes, sizes, colors and finishes to fit every design need. Homeowners no longer have to compromise style for function. From sleek, modern fans with minimal blades, to more ornate or traditional designs, manufacturers are pushing the boundaries and taking fan design to new heights. Learn more about how ceiling fans can help improve your home and save on electricity usage this fall at your local Hortons Home Lighting.